This first quarter of the year was more than promising. It was indeed the highest first quarter in terms of global numbers of IPOs since Q1 of 2007, before the crisis. The outlook for the rest of the current year is optimistic given the encouraging results so far. 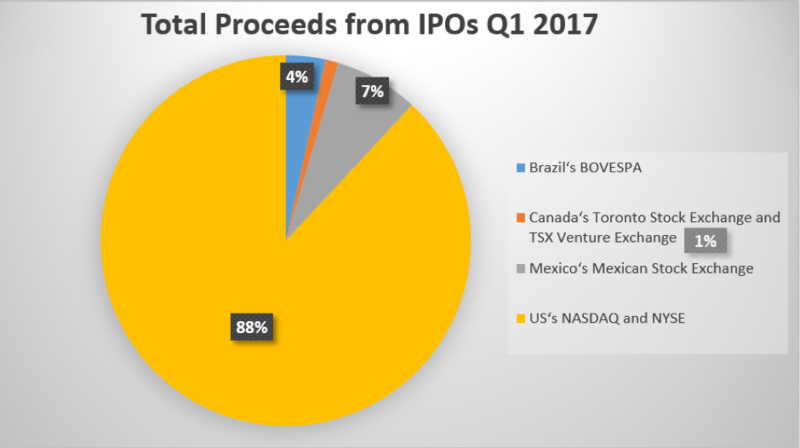 According to the “EY Global IPO Trends: Q1 2017”, there have been 369 IPOs raising US$33.7 billion which translates into a 92% increase YoY. The listing of Snap Inc. - the parent company of Snapchat - has been one of the most anticipated IPOs of the year. The company raised $3.9 billion which represents the largest tech listing since Alibaba with an impressive $25 billion raised. Overall the NYSE was the most active stock exchange by proceeds in Q1. Of course, the IPOs of Snap Inc. and Homes Inc. have played a significant role as they contributed $3.9 billion and $1.8 billion respectively. In other words, 15 listings during these first three months of the year raised $9.6 billion. Many companies in the Americas are expected to take advantage of strong equity valuations and a relative stability in the markets. 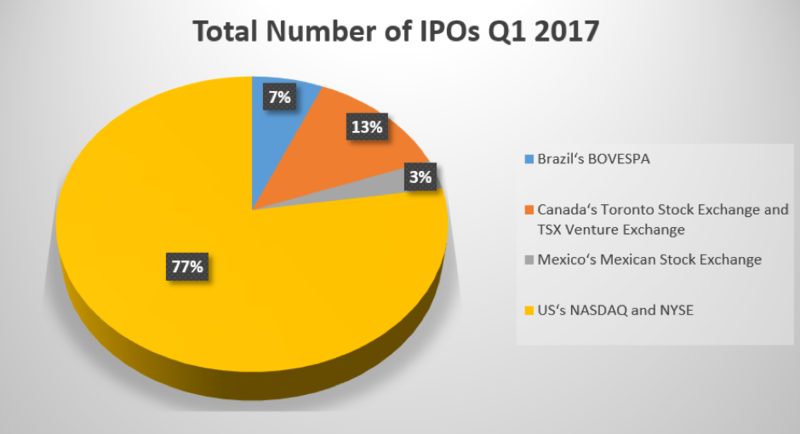 Overall there were 34 IPOs on Americas exchanges raising $12.5 billion, which represents an increase of 1,392% compared to Q1 2016. 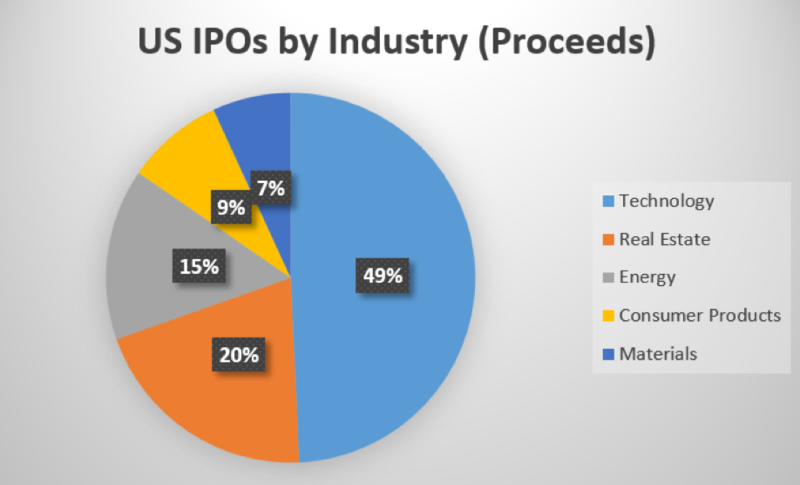 Concerning sectors, technology is the leader in terms of IPOs number, followed by consumer products, real estate, energy and materials. It is worth mentioning that the top 5 - in terms of proceeds - is dominated by US exchanges. In fact, 4 out of 5 these listings took place in the NYSE and the remaining listing in the NASDAQ. Another interesting fact is that the median deal size has been $230.1 million , an increase of 161% compared to Q1 of 2016. Let us now focus on specific companies. Snap. Inc has been the first unicorn – company, usually start-up in the tech industry, with a market valuation exceeding $1 billion - of the year to go public. The listing has been a success, raising $3.9 billion and its shares started trading at $24 giving the company an initial valuation of an impressive $33 billion. However, as of April 28 the shares were trading at $22.55 which translates into a valuation of $26.44 billion. To make a quick comparison with its competitors, Facebook has a market capitalization of $434.22 billion and Twitter $12.03 billion. Other unicorns such as Uber, Airbnb, Spotify and many others are expected to go public in the near future, and these favourable market conditions are encouraging such IPOs. Another interesting news regards the “unicorn” Cloudera, which went public on Friday, 28th of April. The company’s shares closed 21% above its IPO price, translating into a market capitalization of approximately $2.3 billion. Cloudera is a company backed by Intel, which invested $742 million into the big-data company back in 2014. To conclude, favourable market conditions and relative stability in equity capital markets have supported, and will continue to encourage companies to go public. The first quarter of 2017 was off to a strong start and, if the IPO activity keeps this pace, 2017 will be a record-year. Much of the attention will be focused on the so-called unicorns, since these firms have had a relatively easy access to private funding and thus have delayed any plans to sell their shares publicly. If this condition fails to persist, these companies will get listed sooner than expected. Firms such as Uber, Airbnb and Spotify are expected to gather much attention from investors worldwide.